Vintage'ORBOR' Brand Litho Wind Up Horse Cart / Chariot Tin Toy, Germany - 36226. 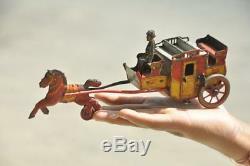 Vintage'ORBOR' Brand Litho Wind Up Horse Cart / Chariot Tin Toy, Germany. Made In Germany By ORBOR. Nice Litho Print All Over. Has 2 Wheels To Move. In Good Working Condition G ood For Collection See Photos for More Details & Actual Condition. Size :- 26.50 x 11 x 7 Cm. (10.50 x 4.25 x 2.75 Inch) Approx. Actual Images of item are shown above. The item "Vintage'ORBOR' Brand Litho Wind Up Horse Cart / Chariot Tin Toy, Germany" is in sale since Wednesday, February 21, 2018.